Today’s mission was to do a big shop at the supermarket with Sam. The primary objectives were to get everything on the list, nothing more or less, and to keep Sam happy during what is usually a fairly long process. Before I was a parent I used to watch people struggle round supermarkets with children and I used to think: “why do they put themselves through this, why don’t they just go without them?”. When I think about this now I laugh at my innocence and naivety, and if anyone said something like this to me now I would reply: “do you really think I’m doing this out of choice?”. Before we moved house I was fairly good at negotiating my way round our local supermarket. Despite frequent changes I generally knew where everything was and could find my way round with the children without falling foul of too many of the marketeers’ traps. I knew where the Lightning McQueen birthday cakes, the Charlie and Lola pink milk, and even the Pooh Bear plasters were; mainly from experience. I even knew how to get down the dairy aisle without ending up with a load of Thomas yoghurts. Now I have to relearn another completely different layout and have to develop a new path through the marketing maze. At this point my old self would have said: “well if they want something why do you not just say no?”. This being the old self that has never been faced with a two year old wanting nothing in life but a torch because it has Mickey Mouse on it who is quickly surrounded by a clutch of grandparents (none of whom I know) offering advice on the matter (because that is the time of day we tend to go shopping). We walk into the store and Sam immediately says: “ice cream”. I now know that if I want to keep him going, then ice cream is the last item on the list to get, it gives him hope. So far so good when we arrive at the start (fruit and veg), Sam happily sat down with his in-trolley entertainment pack. But I immediately knew that it is going to be a long shop when we get to the first item: tomatoes. I pick up a pack of cherry, but Sam is adamant that we have plum and is in no mood for cherry. Ok I can live with plum, and so it goes on around the shop with every other item that goes in the basket requiring either explanation and/ or negotiation and, if I am honest, I am enjoying the challenge. After the tomato incident I generally got my own way, the only additional items being an over priced children’s magazine and (I am not sure how) a very large pot of honey and clementine greek yoghurt, the latter of which Sam became obsessed with (I think it was the bees on the label), but which sounded very tasty so I gave in. When we got to the kitchen roll, however, we played out an all too familiar scenario. I prefer the recycled own brand six pack, Sam likes the one with the elephant on it. I was willing to get the elephant six pack but that was “too big”, this hardened both our resolves and after about five minutes of negotiation we ended up with an elephant two pack “limited edition” and a recycled four pack. Calm descended, and so on to the toilet rolls: “woof woof” said Sam. Well that’s branding for you. In the end not a bad hour in the supermarket, and I pretty much met my objectives. Sam was happy most of the time, including a memorable passage where he insisted on roaring as loud as he could in the cereal aisle (thank you Tony the Tiger), and I got everything on the list with only a few extras. Like many things supermarket shopping is very different with a toddler in tow, it is a challenge, but as with many things if you are up for it, it can be fun and very rewarding; just do not ask me why I could not have come on my own. Categories: Shopping | Tags: branding, negotiation, Sam, shopping | Permalink. As regular readers will know, there are many things about being a parent that have surprised me. The unexpected has become a part of daily life for me, and I never really know what is coming next. This is both challenging and exciting and can sometimes lead to me having mixed feelings about daily life with our boys. On the other hand there are some events which I know will happen as the boys get older. These are events that I have pictured in my mind since I first knew Karen was pregnant, and perhaps even earlier. One of these was seeing a child of mine riding a bike unaided on their own. This is partly because I remember so vividly the moment when my Father pushed me off and I felt the rush of absolute freedom of riding along independently under my own power without the aid of stabilisers. It was an amazing moment for me and it opened up all sorts of new horizons of playing with the older children in the street and, in time, exploring the area where I lived and beyond. Now it was Jake’s turn to try this out. We had been lucky enough to have been given a bike some time ago and Jake had been asking when he could have a try, the only thing holding us back being the fact that it needed a bit of maintenance – including taking off the stabilisers – something we finally got round to doing the other morning. So there were no more excuses, it was a lovely crisp sunny winter’s day, and we went off to a place where there is a flat and wide path. Jake had been using his balance bike (one of those without pedals) for about two years, and he had grown ever more confident in riding it, so we were hopeful that he might pick bike riding up quickly. We were not really prepared for what came next as Karen gave him a push off and he absolutely flew away. He was a little wobbly at first but very quickly found his balance and it quickly seemed as if he had been cycling for years. Jake was so happy and so proud of his achievement and I was pleased that I managed to capture that pride with some photos, a moment that I will never forget and I hope Jake remembers it for years to come. Jake’s achievement, and his pride at doing something so radically new made me think that as we get older there are fewer ‘basic’ (I cannot think of a better word than that at the moment) things that are left to achieve. We learn to walk, read, write, count, and then drive; and while we keep learning all our lives there are fewer single things that give us such a life changing jolt. Having children is one of these moments, it leads to so many changes and new experiences; many are unexpected but some we dream about, hope for and look forward to. Jake riding his bike definitely fell into that latter category, and as the cycle of life continues, I can only wonder what comes next. Categories: Learning | Tags: change, cycling, fatherhood | Permalink. One of the first things people say to you when you announce that you are to become a parent is something along the lines of “well you better get your sleep in now”. This happens again just before the baby’s birth, and then you are constantly asked “are you getting much sleep” for months after the birth. So clearly it is a well established fact that babies equal lack of sleep. And while I know people whose children have pretty much slept through from birth no one escapes with their existing sleep pattern intact (no one who maintains any parental responsibility that is). What existing parents do not mention so much is that their sleep continues to be disrupted, albeit in a less regimented way, beyond the point where the child starts sleeping through. This is where a couple of pictures that have been doing the rounds on Facebook and other social media for a while now come in. They suggest that the difference between the perception and the reality of what it is like to share a bed with a toddler. I think that they are brilliant, and the reality bit describes many nights in our bedroom pretty accurately. What perhaps is more telling is that the perception part of this illustration was what I had in mind before I became a parent. I imagined those idealised images of a mother coming into a bedroom and seeing the father and child snuggled up in a cozy and indescribably cute, yet somehow manly, manner. The reality is not like that, it is really really is not like that. 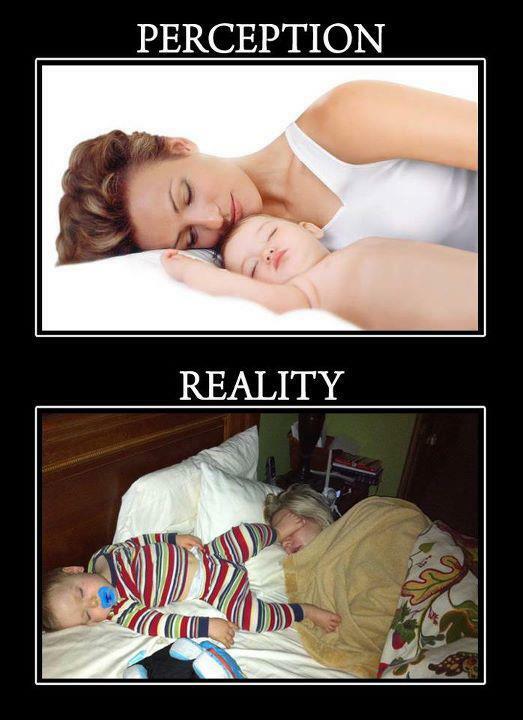 But if it really is not like that then why do the vast majority of photos that I have of either Karen or myself asleep with the children more closely reflect the perception picture rather than the reality one. Well it could be that when reality bites (or rather kicks, gouges and/ or burrows) I am in no fit state to start taking photos. Nevertheless, I seem to like to present some sort of idealised life through the photos that I post on Facebook, which, of course only perpetuates the perception to those not in the know. I also suspect that my friends and family want to see nice pictures of us being happy rather than some gruesome sight of us irritated and tired. Most of all, however, to post unflattering photos would not be fair to the children who do not have much of a say on such matters. So while we present something of an idealised picture, the truth is that being the parents of small children means that a good night’s sleep cannot be guaranteed. Some weeks will go by without incident, while other weeks leave me wondering whether I will ever get a decent night’s sleep again. As the youngest Sam is the most likely cause of disruption. On a good night he will slide in beside Karen in the early hours and go straight to sleep; and on a not so good night he will prowl about, toss and turn, and generally cause havoc for a couple of hours. He is also like a heat seeking missile and, particularly if there is only one adult in the bed, he will follow them around (generally taking up half the bed himself) ensuring that he gets his source of warmth. It has been know for me to be pushed out of one side and get back in the other on more than one occasion during a night alone with Sam. Jake is far more settled these days, and tends to disturb us less; although he tends to find a night when Sam is settled just to keep us on our toes. Indeed, when they were younger I was convinced that they had a “disturb the parents at night” rota worked out between them. The night becomes a very different place with children. It is busier, shorter and full of surprises. It is far removed from the perception illustrated in the above picture, and when I get seven consecutive hours of sleep I consider it a small, but very welcome, bonus. Categories: Sleep | Tags: boys, nights, parenthood, sleep | Permalink. Karen and me had a very different New Year’s Eve this time round. The previous five, since Jake was born, have involved getting children to bed and then hoping they stay asleep during the fireworks, which they always did. We then planned our summer holiday which helped us to look forward to the year ahead, and helped us to stay awake. We would then watch the London fireworks on the BBC, and be in bed by about 12.15. Not exactly the more extensive celebrations of previous years, but somehow representative of our new lives as parents. This New Year’s Eve was different though. We stayed with friends who have children of a similar age to ours, and they invited round other people who also had children of a similar age. We had a great time and so did the children, with both Jake and Sam making it past midnight to watch the extensive fireworks provided for us by the good people of Germany. A time when the whole country seems to go crazy for about an hour. It was a great evening: the boys played nicely with the other children, we got to have good conversations, we danced with the boys, and at around half past midnight they went straight to sleep and slept in in the morning. All in all we had an incredibly relaxing time, and it really encouraged me to have as one of my New Year’s resolution: “meeting more people”. This is a real change for me as I would be the first to admit that I have my misanthropic side. I like my own company, and I need my own space. This, of course, is not always possible with a family and New Year’s Eve made me realise that I often try to extend my need for space to the family level; thinking that doing something just the four of us is preferable to doing it in a bigger group. Now I think about it it is pretty self evident that the boys are going to enjoy themselves more if they have people of their own age to play with and are going to require less looking after and entertaining less. Obvious isn’t it? Well now I think about it, er, yes it is; but it took me New Year’s experience to realise that that is often the case. For me, and I suspect for many other parents, bringing up children is a constant source of these revelatory moments: times when we recognise the obvious and wish we had realised it days, months, or even years ago. What I am coming to realise is that I should not beat myself up about this lack of awareness but just be happy that I realised about things when I did, after all parenthood is a constant process of learning; that is one of the things that makes it so great and so scary at the same time. What I learned this New Year’s Eve is that Karen and I do not have to do it on our own, and that my being that bit more sociable may help that process along more than I realised. Categories: Learning | Tags: boys, friends, New Year's Eve, parenthood, parties | Permalink.